Did you know that more people come to know a personal relationship with God because of a friend or relative who told them about how much God loves them? It's true. Why would your friend trust a stranger? 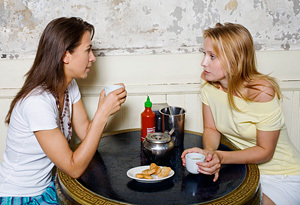 When is the best time to talk about God with your friend? I found that when I see my friend lonely or in despair, or suffering I can say, "I've felt like that before." But if I haven't felt like that, if I haven't had their sickness, I can say I know Someone who cares because He showed me how much He cares for me. Jesus called Andrew one day and Andrew felt so wonderful that he went and brought his brother, Simon (also called Peter) to Jesus. The next day Jesus called Philip and He couldn't wait to tell his friend, Nathanael, about the Messiah, Jesus, the Son of Joseph from Nazareth. "Nazareth? Can anything good come from Nazareth?" asked Nathanael. "Come and see," said Philip and convinced Nathanael to come. Jesus said, "Here is a true Israelite; no deceit is in him." "How do you know me?" asked Nathanael. "I saw you under the fig tree," said Jesus. Then Nathanael recognized Jesus as the Son of God. Jesus said, "You believe because I said I saw you under the fig tree. You will see greater things than this." This is how our lives with God begin. First we accept what others say about Him and then we accept Him into our lives. We learn how to have a relationship by reading His word and talking with Him in prayer. He becomes our Friend, a Partner in all we do. Is there someone you would like to tell about Jesus? Pray for an opportunity and then watch what God will do. Lord Jesus, thank You for showing me how much You love and care for me. I pray for an opportunity to tell my friend, _________, how You made me feel when I was [lonely or sick or intimidated]. I pray for courage to speak boldly and lovingly. Amen. Many of my articles and stories have been published in Christian magazines and anthologies. I have also ghost written articles for Harvard Business Review and Examiner.com. I live with my husband John and pet dog Maggie in Carmichael, California. We enjoy vacationing at Lake Almanor and fishing the high mountain streams in Northern California.